As winter turns to spring, college football starts a new chapter. A new season approaches, but it is still too far off for our liking. Therefore, we will fill these agonizing weeks with our position-by-position rankings of the top five players entering the 2015 season; this week we will name our top five defensive lineman. The only thing we are certain of about next season is that these rankings are sure to be wrong, so let us know why we are full of it in the comments below. Enjoy! is on the field. The country was in awe of Oakman when they saw how big this physical specimen actually was; now, we have a chance to be awed by his performance on the field. William McFadden – I knew that 2015 was going to be a good year when Oakman decided to bless the internet with his person. Actually, that Baylor – Michigan State game was one of my favorites; between the Oakman memes and the Bears’ punter regretting the day he ever put on shoulder pads, it was just an entertaining game. The Baylor defensive end is not just a massive body, however; he has learned how to play with his massive frame and can wreak havoc in an opponent’s backfield. Known for its offense, Baylor could have one of the best defensive lines in the country next season, and Oakman will be a large part of it. Clinton Brannen – With or without video, the physical tools immediately standout. Oakman, standing at 6’9” and weighing 280, is a freak of nature. He registered 11 total sacks last season. Baylor is lucky to have him back for his senior season, as most expected him to declare for the NFL Draft. But with his return, they will pair him with Andrew Billings, a 6’2”, 300 pound defensive tackle, which will form one of the most formidable defensive lines in all of the country. 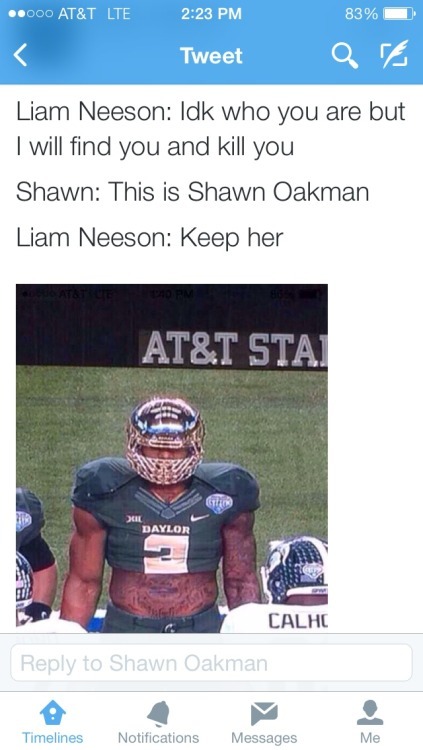 Erik Weiss – By now, we all know who Shawn Oakman is. His physical attributes are so impressive that he broke the internet; Oakman has everything you want from a defensive end. The issue with him so far is that he has yet to produce the results that everyone expects of him. Yes, he did have 11 sacks and 12.5 tackles for loss and was given All-Big 12 honors. However, Oakman is easily capable of producing 15+ sacks on his way to All-American honors as well as an early draft pick. Oakman has been the heart and soul of this Baylor team for the past two years, and will look to improve upon a very promising 2014 season. Another returning senior who spurned the NFL Draft to go back to college with his veteran teammates, Calhoun broke out in 2013 to the tune of 37 tackles, 7.5 sacks, 14 tackles for loss and three defensive touchdowns (two fumble returns and one interception return). The fifth-year senior was rated as high as 20th on Mel Kiper’s Draft Board, but returned to win a championship with his teammates. He is not as big as Oakman, and did not have the same type of season statistically, but Calhoun has a higher ceiling if he puts everything together. A well-rounded player, Calhoun is consistent across the board and doesn’t have a glaring weakness. His play isn’t flashy, but he will surely stand out on an extremely talented defensive line. Erik Weiss – Many, including me, were surprised when we heard that Shilique Calhoun would return for another year at Michigan State. Sporting News ranked the two-time All-American as college football’s 23rd best player for 2015. I wholeheartedly agree with that ranking. Calhoun has consistently been one of the premiere defensive lineman in the country, producing 16.5 sacks in 40 games. Although his numbers may not be off-the-charts, his aggressiveness and football instincts allow him to make plays whenever his team needs him. William McFadden – As Erik said, Calhoun’s numbers won’t blow anyone away, but his impact on games cannot be ignored. If there is one word to describe this Spartan, it is consistent. During his senior year, Calhoun can work on developing an NFL-caliber move to get to the quarterback, but many believe he could be a top-15 pick in next year’s draft. Calhoun served as a team captain during his junior season, and will likely have the role again as a senior. The trust his teammates have in him speaks to Calhoun’s character, but it is his passion for football that helps him stand out on the field. Clinton Brannen – Calhoun, the 2013 Big Ten Defensive Lineman of the Year, repeated his great success last season by totaling eight sacks and 12.5 tackles for loss.The NFL Advisory Committee believed Calhoun was a first-day pick, but the junior decided to return for his senior season and try to become a guaranteed first-round pick. There is absolutely nothing about Nkemdiche’s stats that warrants him a spot at No. 3 on our list, yet here he is. After arriving at Ole Miss as the second coming of Jadaveon Clowney, Nkemdiche struggled in his first season at defensive end. The coaching staff, noticing that his skill set was not suited to defensive end in the SEC, decided to move Nkemdiche to defensive tackle. Adjusting to a new position can be difficult, and it took time for the former 5-star recruit to get comfortable, but Nkemdiche finally played well down the stretch for Ole Miss. Though the stats may not reflect it, the sophomore lineman’s performance was a crucial part of a Rebel defense that allowed only 16 points per game last season. True, Nkemdiche’s spot on this list is due to his massive potential, but there is enough substance there to make his breakout in 2015 a pretty safe bet. Clinton Brannen – Coming out of high school, Nkemdiche was the No. 1 overall recruit. At that time, he was rated as the top defensive end, but since then, he has moved to defensive tackle at Ole Miss. However, his talent has still not caught up with his production. In two seasons, he has totaled 12 tackles for loss and four sacks. The Rebels will be counting on much more from Nkemdiche in his junior season. Erik Weiss – The former number one recruit has yet to disappoint for the Rebels. Although he has yet to produce the numbers that everyone would like, he has been a consistent force up the middle for Ole Miss. Nkemdiche is the definition of an elite player in the making. Currently, his best attribute is his potential. With only two sacks last year, Ole Miss is hoping Nkemdiche will open it up and finally discover his talent. I believe that he will be able to do just that. William McFadden – It wasn’t ever a matter of if Nkemdiche would dominate in the SEC, but how soon it would take him. Well, two years into his Ole Miss’ career, dominant may not be the correct adjective. After a relatively disappointing freshman campaign, the Rebels’ coaching staff decided that defensive end may not be the ideal position for Nkemdiche and moved him inside for 2014. Clinton and Erik are correct in saying that his potential is what sets him apart. Although the production has not been where many thought it would be, Nkemdiche has the ability to produce double digit sacks and 50 plus tackles. into errant throws. According to Bosa, he still has improvements to make. A new and improved Joey Bosa will be keeping Big Ten quarterbacks up at night. Erik Weiss – I’d prefer to consider Joey Bosa at 1b to Myles Garrett’s 1a. They are that close to each other. Bosa is coming off an unbelievable year for the National Champion Buckeyes. He finished fifth in the country in sacks with 14 and was easily the best player on OSU’s defense. Bosa was named Defensive Lineman of the Year and received All-American honors. He is a force to be reckoned with off the edge and will continue to produce superstar numbers. Clinton Brannen – Bosa was named the Smith-Brown Defensive Lineman of the Year last season. This award alone speaks for itself. During the regular season, he registered 13.5 sacks and 20 tackles for loss, which were both improvements from 2013. However, in Ohio State’s two biggest games against Alabama andOregon, Bosa did not record a sack; his performances on the big stage allow for his biggest room of improvement, but when dealing with a player of this caliber, that is just being nitpicky.
. If that isn’t a ringing endorsement of what kind of season this freak athlete can have in 2015, then what is? Clinton Brannen – Myles Garrett posted one of the most remarkable seasons by a freshman defensive end in recent history, as he broke the school and SEC sack record for a freshman. He registered 11.5 sacks, 14 tackles for loss and nine quarterback hurries. Garrett did not stop there, though. He recorded 53 total tackles throughout the season, with 10 coming in one game. While it is a small sample size and possibly his numbers are skewed against lesser opponents, Garrett’s first season gives us reason to believe he could prosper into a Pro Bowl defensive end.
. It is easy to get excited about a player like Garrett, because he is still at that phase of “just how good can he be.” The possibilities are endless, and we don’t know where his ceiling is. If he can get close to it in 2015, Garrett could become a folk legend in College Station. Erik Weiss – For me, it is hard to write about Myles Garrett without displaying any bias. If you read my last article about Texas A&M, you would have seen how much I praised him. Garrett came off one of the best seasons in freshman history. He broke the freshman record for sacks with 12, which also was good for eighth in the country. Garrett is able to succeed through his elite athleticism. He is unbelievable quick and agile for his position, making him virtually unguardable for offensive linemen. With the addition of freshman Daylon Mack, he will hopefully receive less attention than anticipated and continue to put up huge numbers.